Habaneros hate rain and can be cast into depression by what any British person, accustomed as one is to endless meteorological variations on the theme of wetness, would consider a mere caprice. The slightest hint of impending rainfall can keep the city’s entire workforce at home and no demur whatsoever is made by their bosses if workers fail to appear on a wet day. The very notion of venturing out of the house in the rain is seen as dangerous madness, likely to bring on agues, seizures, fevers and a whole range of obscure disorders which may only be countered by a series of stressful and expensive visits to the babalawo. ‘When necessity compels them to appear,’ wrote one nineteenth-century observer of Habaneros in the rain, ‘they walk with the peculiar circumspection of a cat, picking their way with a care and timidity that often seems highly ludicrous’. But much of the horror with which rain is viewed is justified. The damage caused by hurricane winds is as nothing compared to the devastating effects of the downpours that follow such storms. They saturate Havana’s shaky eighteenth-century palaces which, as they dry out, have a tendency to fall down without warning. 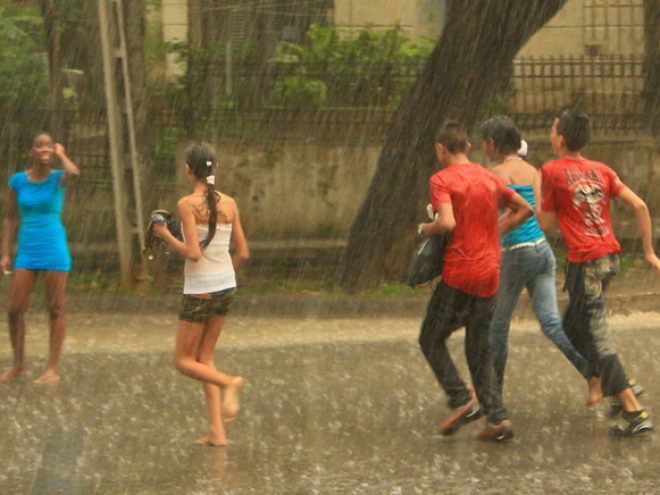 Rain in Havana falls in a roaring whoosh of water that foams out of gutters, jets from downpipes, courses along pavements, pounds on the leaves in the courtyards of the palaces and fills the squares to fabulously Venetian effect. There aren’t many umbrellas to be had in the city and it’s a waste of time to use one, for the water bounces up from the pavement with at least as much force as it falls, soaking one from the bottom up. A serious catastrophe for an Habanero is rainfall at the end of the working day, and a miserable chorus of ay, mi madre rings out when the first drops fall at 4:40pm. But a bottle of añejo is found in someone’s filing cabinet and with music downloaded from the internet everyone dances until the rising tide resulting from the leaky office roof starts lapping at their ankles. Then it is time to espouse the Revolutionary spirit of trabajo voluntario, dig out the mops and engage with the flood. And if it’s still raining by midnight everyone’s drunk enough to brave it, keeping off the worst of the deluge as they slosh homewards by sidling along the sides of the streets, under the protective overhang of the balconies, agreeing with each other in ever-so-slightly slurred tones that there’s no rainproofing like rum. November 2014 This article formed part of the november 2014 issue of What’s On Havana The definitive monthly travel & culture guide to Havana Download our current issue of What’s On Havana, your definitive travel, culture and entertainment guide for all things happening in Havana, Cuba’s bustling and enigmatic capital city. We include features from around Cuba written by the best international travel writers covering Cuba. Our monthly online digital magazine is also available in Spanish and French.